At some point on the test, you’ll be asked to draw the Lewis structure for a molecule or polyatomic ion. Here’s how to do it. 1. Count the valence electrons in the molecule or polyatomic ion; refer to this page for the periodic table. 2. If a polyatomic ion has a negative charge, add electrons equal to the charge of the total in (1). If a polyatomic ion has a positive charge, subtract electrons equal to the charge of the electrons from the total in (1). 3. Draw the skeletal structure of the molecule and place two electrons (or a single bond) between each pair of bonded atoms. If the molecule contains three or more atoms, the least electronegative atom will usually occupy the central position. 4. Add electrons to the surrounding atoms until each has a complete outer shell. 5. Add the remaining electrons to the central atom. 6. Look at the central atom. 1. (a) If the central atom has fewer than eight electrons, remove an electron pair from an outer atom and add another bond between that outer atom and the central atom. Do this until the central atom has a complete octet. 2. (b) If the central atom has a complete octet, you are finished. 3. (c) If the central atom has more than eight electrons, that’s okay too. Let’s find the Lewis structure for the ion. 1. Carbon has 4 valence electrons; oxygen has 6. 2. The ion has a charge of −2, so add 2 electrons. 3. Carbon is the central atom. 4. Add electrons to the oxygen atoms. 5. We’ve added all 24 electrons, so there’s nothing left to put on the carbon atom. 6. (a) We need to give carbon a complete octet, so we take an electron pair away from one of the oxygens and make a double bond instead. Place a bracket around the model and add a charge of negative two. When we put a double bond into the ion, we place it on any one of the oxygen atoms, as shown below. All three resonance forms are considered to exist simultaneously, and the strength and lengths of all three bonds are the same: somewhere between the strength and length of a single bond and a double bond. To determine the relative length and strength of a bond in a resonance structure, a bond order calculation can be used. A single bond has a bond order of 1, and a double bond has an order of 2. When resonance occurs, pick one of the bonds in the resonance structure and add up the total bond order across the resonance forms, then divide that sum by the number of resonance forms. 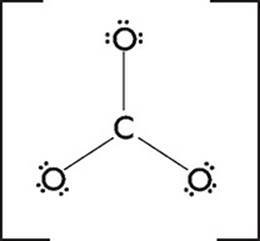 For example, in the carbonate ion above, the top C–O bond would have a bond order of (1 + 2 + 1)/3, or 1.33. Bond order can be used to compare the length and strength of resonance bonds with pure bonds as well as other resonance bonds. Some atoms are stable with less than eight electrons in their outer shell. Hydrogen only requires two electrons, as does helium (although helium never forms bonds). 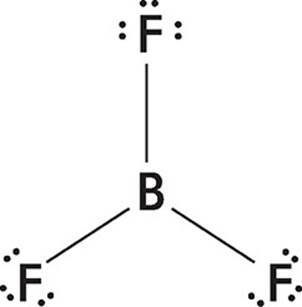 Boron is considered to be stable with six electrons, as in the following BF3 diagram. All other atoms involved in covalent bonding require a minimum of eight electrons to be considered stable. In molecules that have d subshells available, the central atom can have more than eight valence electrons, but never more than twelve. This means any atom of an element from n = 3 or greater can have expanded octets, but NEVER elements in n = 2 (C, N, O, etc.). Expanded octets also explains why some noble gases can actually form bonds; the extra electrons go into the empty d-orbital. Sometimes, there is more than one valid Lewis structure for a molecule. 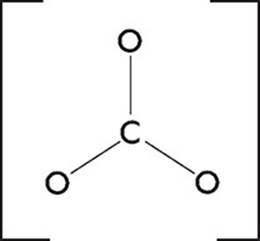 Take CO2; it has two valid structures as shown below. To determine the more likely structure, formal charge is used. To calculate the formal charge on atoms in a molecule, take the number of valence electrons for that atom and subtract the number of assigned electrons in the Lewis structure. When counting assigned electrons, lone pairs count as 2 and bonds count as one. 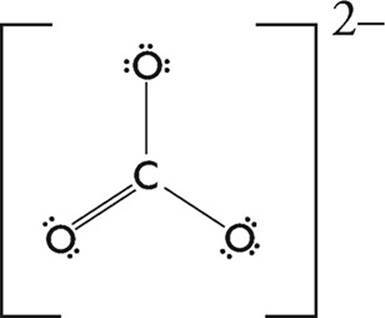 The total formal charge for a neutral molecule should be zero, which it is on both diagrams. Additionally, the fewer number of atoms there are with an actual formal charge, the more likely the structure will be—so the left structure is the more likely one for CO2. For polyatomic ions, the sum of the formal charges on each atom should equal the overall charge on the ion. Electrons repel one another, so when atoms come together to form a molecule, the molecule will assume the shape that keeps its different electron pairs as far apart as possible. When we predict the geometries of molecules using this idea, we are using the valence shell electron-pair repulsion (VSEPR) model. In a molecule with more than two atoms, the shape of the molecule is determined by the number of electron pairs on the central atom. The central atom forms hybrid orbitals, each of which has a standard shape. 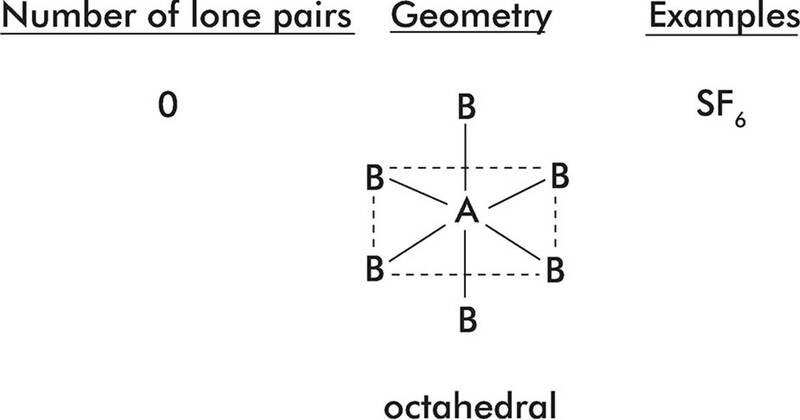 Variations on the standard shape occur depending on the number of bonding pairs and lone pairs of electrons on the central atom. 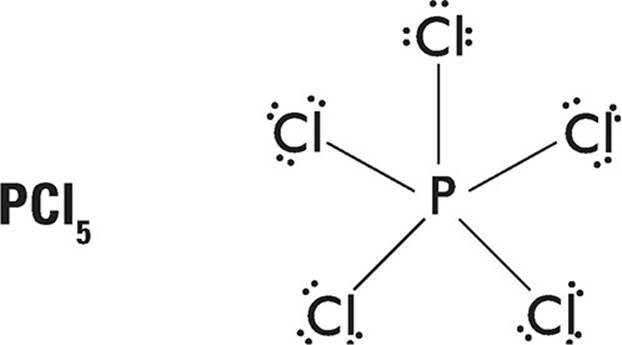 Here are some things you should remember when dealing with the VSEPR model. · Double and triple bonds are treated in the same way as single bonds in terms of predicting overall geometry for a molecule; however, multiple bonds have slightly more repulsive strength and will therefore occupy a little more space than single bonds. · Lone electron pairs have a little more repulsive strength than bonding pairs, so molecules with lone pairs will have slightly reduced bond angles between terminal atoms. The following pages show the different hybridizations and geometries that you might see on the test. If the central atom has 2 electron pairs, then it has sp hybridization and its basic shape is linear. 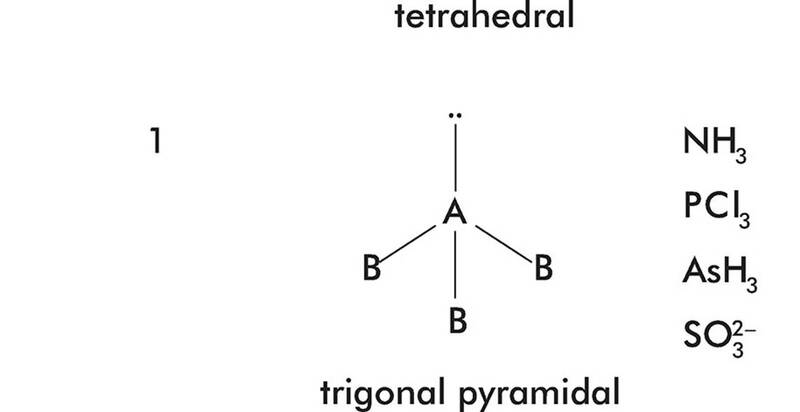 If the central atom has 3 electron pairs, then it has sp2 hybridization and its basic shape is trigonal planar; its bond angles are about 120°. If the central atom has 4 electron pairs, then it has sp3 hybridization and its basic shape is tetrahedral; its bond angles are about 109.5°. 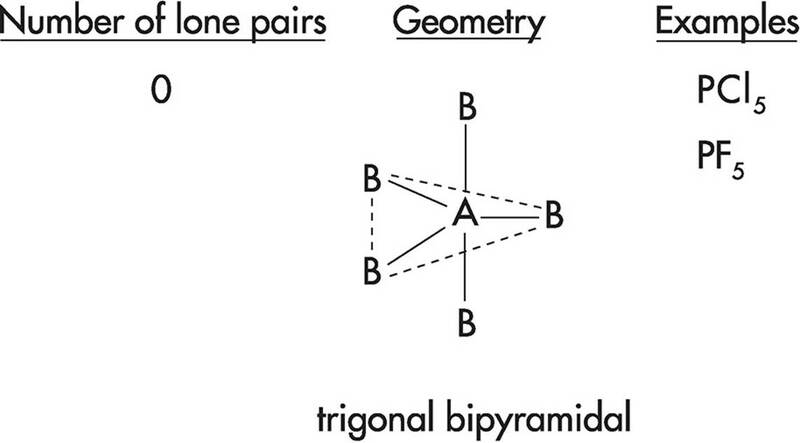 If the central atom has 5 electron pairs, then it has dsp3 hybridization and its basic shape is trigonal bipyramidal. If the central atom has 6 electron pairs, then it has d 2sp3 hybridization and its basic shape is octahedral.